OpenWrt is a firmware for embedded devices used to router traffic. 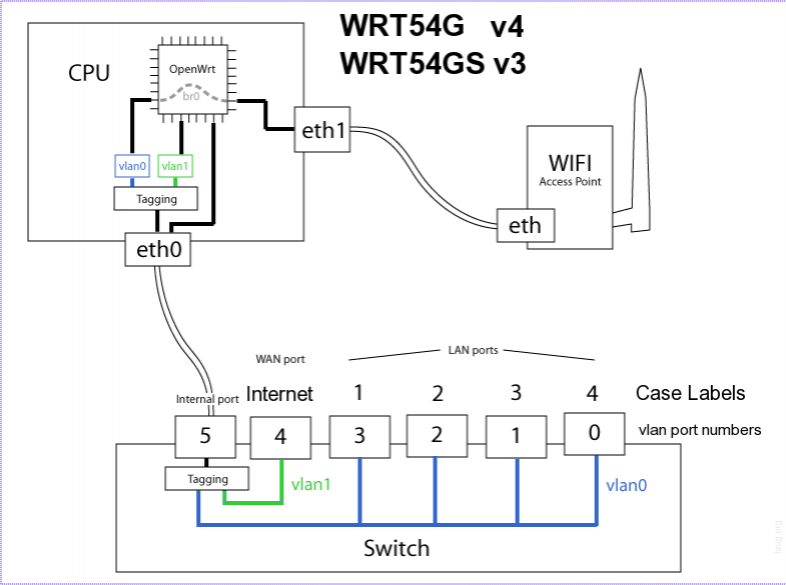 In this case we will be considering the use of OpenWRT in domestic routers such as the test hardware Linksys Wireless-G Broadband Router WRT54GL v1.1. OpenWrt is Linux based so it included the Linux kernel as well as BusyBox. It has a package manager called opkg (similar to apt in ubuntu). As shown in the above diagram, this switch separates the LAN ports and thWAN ports . The other statements in the configuration file describe the interfaces. The interfaces are logical networks, for the setting of IP address, routes and other magic. The 3 interfaces that we have here are named loopback, lan and wan. The physical interfaces associated with these logical interfaces are lo, eth0.0 and eth0.1.